Hard frost last night. We had it coming after a long and warm growing season. But it’s not the end. Like I say in my book a success is not the end a failure is not the end. It’s the beginning of something new. Don’t throw in the trowel. This may be the end of the “growing” season but it is not the end of the “gardening” season. The soil is still warm and roots will remain active in that soil. With little stress on the top of the plant as it shuts down for winter and sends food reserves into the root system, it’s a great time to move plants. Have a plant that has overgrown it’s space? Want to rearrange your “hort-folio?” This is a great time to move a plant or put a new one in the ground. On a day when the air is calm, lay out newspaper on top of the grass in the area you want to create a new flower bed. Have a hose handy. 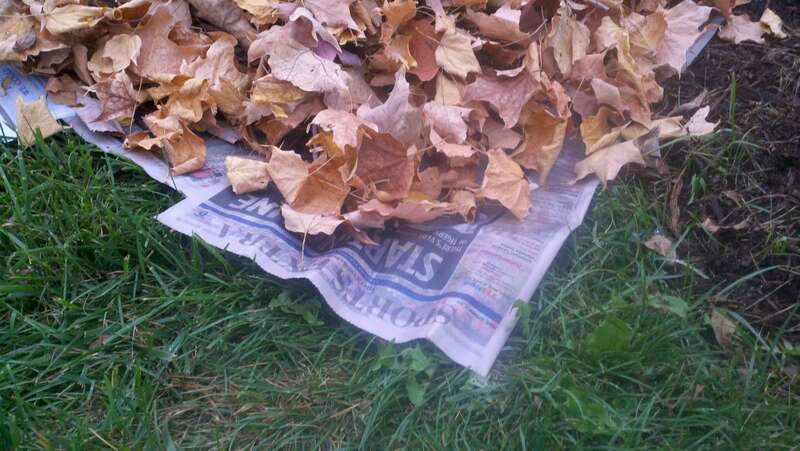 When I set the newsprint down on the grass I wet it down to hold it in place. Create the shape and size of the bed you want with the newsprint. Leaf Lasagna Passive Composting for a new garden bed! of the newsprint, again in the shape and size of the new flower bed you are creating. Finally put soil on top of the leaves (the third layer in the process) to hold the leaves in place. The combination of newspaper, leaves and soil will suffocate the lawn area and “cook” until next May when you till the area into a wonderful media for planting something new! No heavy lifting tearing out sod! I don’t agree with the old adage, “you made your bed now lie in it.” Get up and change your bed. You have options. Have a great day!